I want to thank my two buddies who cheerfully and enthusiastically joined me as I blindly bumbled my way through yet another one of my overly ambitious projects. Your friendship is every bit as wonderful as this limoncello, and as you learned today, that is high praise indeed. I had fun working with you and I’m already looking forward to next year’s batch, when we’re older and wiser limoncello makers. I though this would be the easiest part, but it was actually a lot more challenging than expected. If I was flying solo, this would have been infinitely more difficult, so if you want to embark on this project, I highly suggest recruiting a friend or two. Two essential things we used today are cheesecloth and a funnel. I initially poured it through a colander and the results were poor. The cheesecloth lining the colander made all the difference. Also, a large pot, a large (recently scrubbed) sink, and a large spouted container were needed. 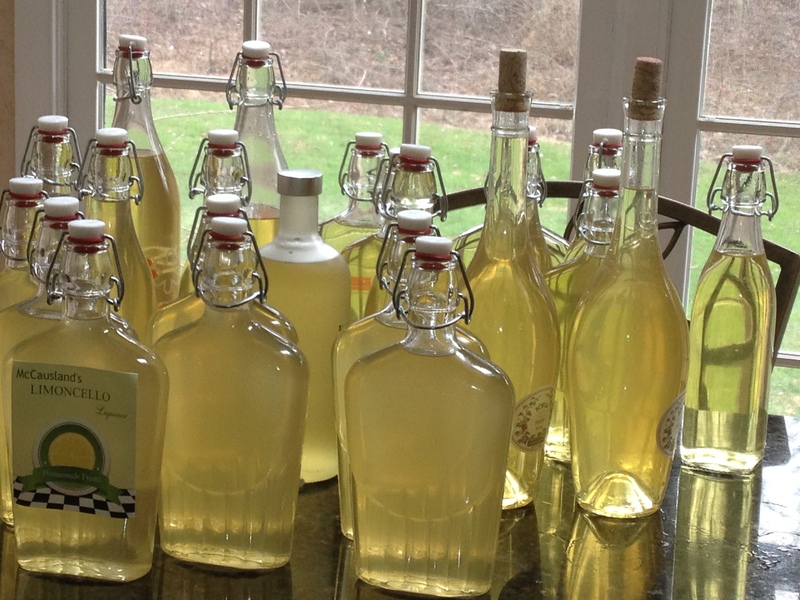 There was a lot of pouring back and forth, a lot of straining, and a lot of stickiness, but in the end, we each walked away with a nice batch of limincello just in time for the holiday season. This entry was posted in Beverage and tagged lemoncello, limoncello by Mom Mom's Apron. Bookmark the permalink.